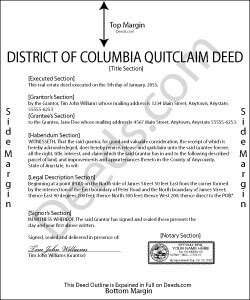 Statutory Requirements for Quitclaim Deed Forms in the District Of Columbia. DC ST 42-601 provides a form for a generic grant deed. It also allows for modifications to the statutory form so that the deed can clearly represent the grantor's intentions. By giving the form an appropriate title, in this case, "Quitclaim Deed," and replacing the word "grant" with "quitclaim," any implied warranties are nullified. This statute also directs the minimum requirements to execute a quit claim deed. Include the date the deed is executed (signed by the grantor); the names and addresses of all grantors and grantees who are party to the transfer of ownership; the consideration paid for the property (usually money); the legal description of the property; the grantor's signature; and an acknowledgement by a notary or other official authorized to administer oaths. Also, any instrument conveying property ownership must be in writing (DC ST 42-1017). Washington, DC follows a "race-notice" recording statute as defined within DC ST 42-401. Any deed changing the ownership status of real property in the District, executed, acknowledged and certified as provided in 42-101, 42-121 to 42-123, 42-306, and 42-602 and delivered to the grantee, is considered in effect from the date of the delivery. If it is not then submitted to the recorder for entry into the public records, the notice only applies to the parties on the quit claim deed, but not necessarily anyone else. This position is further clarified in 42-406, which states that when two or more deeds of the same property are made to bona fide purchasers for value without notice, the deed or deeds which are first recorded according to law shall be preferred. catheirne o. said: Easy to use!